Well it is finally here. Fishing season opens today. Yes! Unfortunately I am working today and will not be able to get out. That is not that big of a deal though because the waters are still high and the trout won't be taking a whole lot yet. Can't wait though to cast a line. There is nothing better than hearing that whizzzzz of a cast on a crisp quite morning, well wait....maybe the splashing of a lunker as it takes the bait and you set the hook is better. Then again the sound of a trout frying over an open fire sounds even better again, and it smells incredible to boot. Okay lets face it there is nothing better than a day out fishing, even when the weather is bad. When you go fishing things can be going terrible but somehow you always end up enjoying yourself. I can remember forgetting the bait for a weekend trip we had planned and not having a shovel to dig more. We looked like a bunch of ravenous bears scrounging for bugs as we used anything we could to dig for worms. Why is it that this trip stays in my head even though it occurred many years ago? The trials and tribulations make it all that much more rewarding and thus memorable. Fishing is a sport for all to enjoy. No matter your societal status, race, gender, or age, you can enjoy fishing. Some fish out of necessity while others fish purely for the joy of catching that huge trophy. I fish just to be out there in the woods. I love wandering up small streams, down boulder havens with wild currents. I love the game of hide and seek and trying to guess where a fish might actually be. "Are they under that overhang? or in the deep pool next to the bank? I wonder if that back eddy would serve as a resting area? Come out, come out, wherever you are. Even on days where I don't catch anything, I still enjoy being out there. I hope you all enjoy the fishing season. Fish by the rules though. 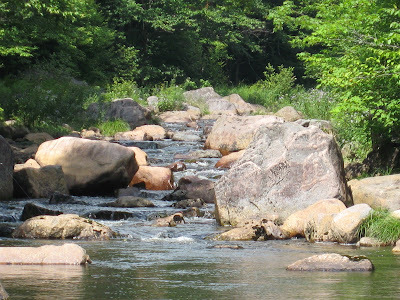 My pic this week is of one of my favorite fishing rivers. Of course I won't tell you where it is but I will say this: "The fish are always there and there are plenty of them." the forest is alive with praise. pine trees swaying with the breeze. behind rocks in the rapids.